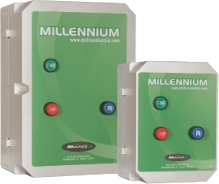 Multico offers a wide range of industrial starters gathered under the Millennium series. The affordable prices as well as the availability of these starters will no doubt fill the needs of our industrial, commercial or agricultural customers. The motor that you will connect to one of our starters will benefit from an excellent protection against overloads and phase losses. Our wide range or ultra-resistant type of boxes and pilot devices ensure you to get, upon request, a perfectly sealed waterproof starter well adapted to your environment. All our starters come with a one year warranty and for a better service, we hold a vast stock of standard starter models. For your specific needs, we guarantee that we will manufacture and deliver in the fastest delay to suit your expectations. ​Multico offers a wide range of industrial starters gathered under the Millennium series. The affordable prices as well as the availability of these starters will no doubt fill the needs of our industrial, commercial or agricultural customers. The motor that you will connect to one of our starters will benefit from an excellent protection against overloads and phase losses.